As we mentioned within the previous post,the 24 reduced Fibonacci numbers when placed around a circle, visibly generate the form of the 5 Platonic solids. This time around,we are going to look closely at how this strange phenomena occurs. 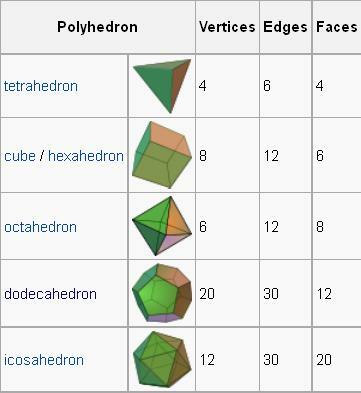 In Euclidean geometry, the Platonic solids present as being regular,convex polyhedrons. Their faces are congruent regular polygons, with the same number of faces meeting at each vertex. Within classical thought,there are five solids which meet this criteria; each of which is named according to its specific number of faces. Plato in his work ‘Timaeus’ writing around C.350 BCE, made a connection between these 5 polyhedra and the classical elements. He equated the tetrahedron with the element of fire,the cube with that of Earth,the octahedron with Air,the iscosahedron with Water and the dodecahedron with the quintessence or the heavens and the constellations. 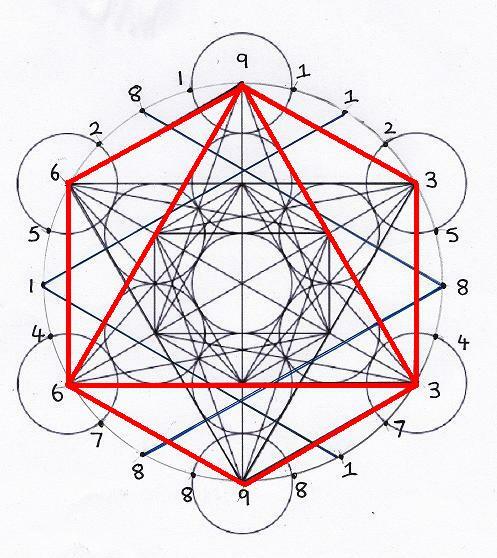 In terms of a connection with Lurianic qabalah,Leonora Leet,in her book ‘The secret Doctrine Of The Kaballah’,equates the 5 Platonic solids with the ‘Partzufim‘; the five faces of God; Arech Anpin,Abba,Imma,Z’eir Anpin and Nukvah-The unmanifest,the father,the mother,son and daughter. As we neither have the time or space to peruse this connection in any depth,as this presents such a complex and detailed subject-its possibly best to leave it to you,the reader to decide whether to investigate this apparent connection in any greater depth. The tetrahedron is the first manifested polyhedra,believed by Plato to equate with the element of fire. 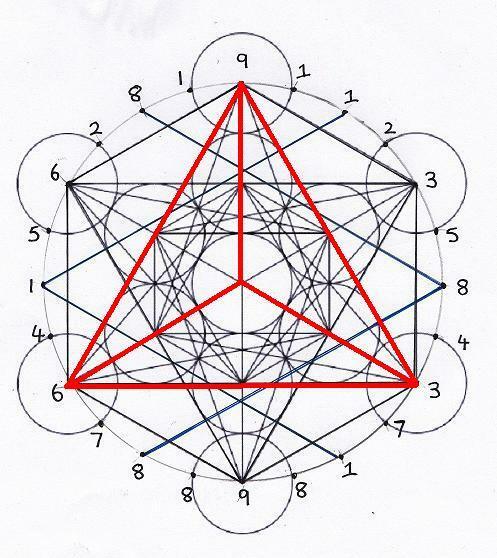 in our Fibonacci circle,it is generated by the interaction of the star configuration formed by the 3,the 6 and the 9. In qabalistic thinking,the tetrahedron is held to self-replicate into a star tetrahedron,as a primary manifestation of duality.In the instance of our device this means that it drops below and forms another tetrahedron from the remaining 3,6 and 9. The vertices of this emergent star tetrahedron supply all the points of manifestation of the next two solids,The cube and the Octahedron,a pairing of solids which are held to manifest coterminously with each other. The cube,equated with the element of Earth,again in its generation,is a product of the 3 6 and 9 matrix. 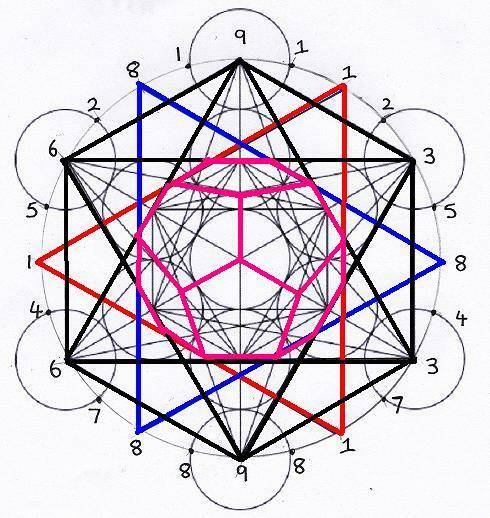 Its 6 faces provide for the manifestation of the third solid,the octahedron,within which, its vertices are located at the the point of the centres of the cubes faces. The octahedron,with its classical connection to the element of Air,is also like its partner,the cube,generated by the same 3-6-9 template. We now come to the final pairing,the icosahedron (Water) and the dodecahedron (Quintessence),these differ markedly from the previous solids in that they are dependent upon a new template in order to manifest within the Fibonacci numbers.We now see that another star,one comprised of groupings of the 1-1-1 and 8-8-8 numbers now comes into play, in order to provide the relevant energetic pathways required to generate these two solids. 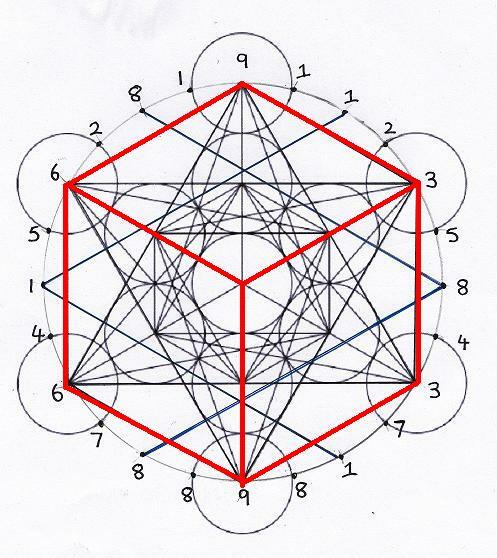 Having studied the Metatron cube for some time in order to understand how these polyhedra emerged,it felt to us as though they did not manifest in a way that felt to fit in naturally with the schema-there were simply insufficient co-ordinates within the structure of the Merkabah/Metatron cube,to account fully for their presence within this design.It was only when the 24 reduced Fibonacci number pattern was added to the Metatron cube in its 15 degree increments that it became patently clear that these two solids were indeed integral components of the overall design. 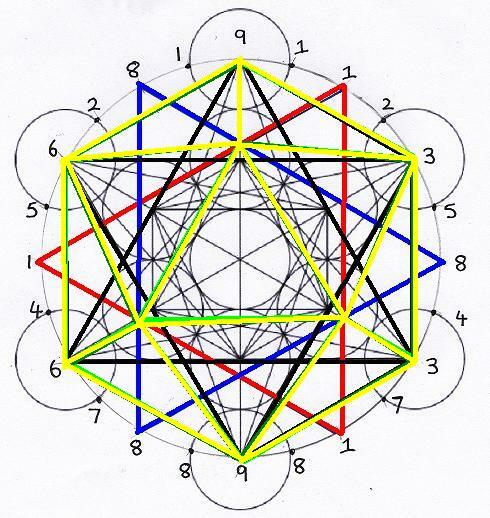 The dodecahedron (The cosmos/Quintessence), sits comfortably within the matrix created by the 3-6-9 configuration and the 1-1-1/8-8-8 star. This entry was posted in 24 Fibonacci sub-code, Fibonacci Numbers, Metatron Cube, Platonic Solids, Prime Numbers. ← Placing the 24 Fibonacci numbers around a circle. I like the valuable info you provide in your articles. I抣l bookmark your weblog and check again here frequently. I’m quite certain I抣l learn many new stuff right here! Good luck for the next! Thanks for the kind words and so glad you find the info we are posting to be of value! I have someone making an orgonium pendant with this design, I am sure it will be quite powerful! Thanks for the feedback Rik…Keep looking in I will post more soon.